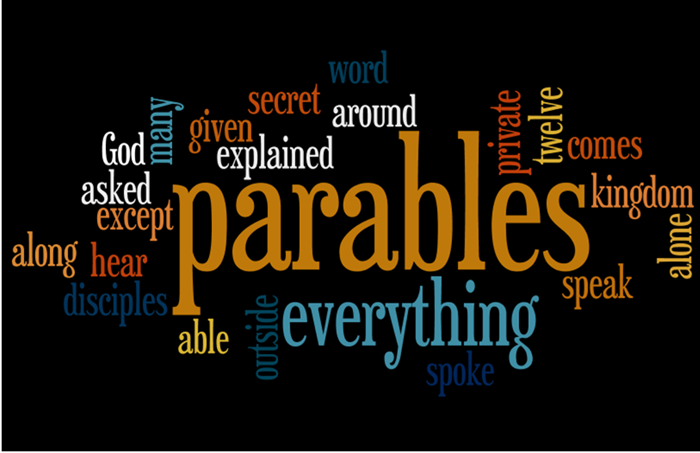 What is a parable? A parable is a fictitious or made up story designed to teach a lesson through comparison. When you hear the story, you can relate it to your own life. It is like an illustration for the points in a sermon. It conveys its message of truth through analogy, through comparison or contrast. Parables are great because they tell a story that is easy to remember. How many of you can tell me the story of the three little pigs or Goldie Locks and the three bears? All of you. How many of you studied those stories this morning before you came to church? It is not like a bunch of principles we try to memorize and soon forget. Parables are told so that only those who really care will come to know the truth. Not so much because they understand the parable, but because they care enough to ask what it means after the story is finished and hang around long enough to have it explained to them. The others don’t really care and leave. Remember, the disciples didn’t understand the parables, but they asked what Jesus meant after the crowds left. They had a soft and open heart. Understanding is an issue of the heart. Those who have a hard heart, also have closed eyes and closed ears and they don’t understand. 1. “Therefore I speak to them in parables; because while seeing they do not see, and while hearing they do not hear, nor do they understand. 5’ And understand with their heart and return, And I should heal them. 3’ and your ears, because they hear. 1’ desired to see what you see, and did not see [it]; and to hear what you hear, and did not hear [it]. At the center of the chiasm is the reason for the parables. Numbers 5,6 & 7 show that their hard hearts have closed their ears and eyes. Therefore they cannot see the kingdom that has come upon them. 10 The disciples came to him and asked, “Why do you speak to the people in parables?” 11 He replied, “The knowledge of the secrets of the kingdom of heaven has been given to you, but not to them. 12 Whoever has will be given more, and he will have an abundance. Whoever does not have, even what he has will be taken from him. So, whenever you read a parable, you need to ask yourself, “What does this tell me about the kingdom of God?” What do I mean by kingdom of God? We will come back to this a little later. Also, notice Matt 13:12. It says, “Whoever does not have, even what he has will be taken from him.” This is very important for understanding the rest of Matthew and the parables. The message of Mat 21:43 is repeated over and over again in the parables. What will they lose because of their unbelief? They will lose the kingdom. They had the responsibility of being the custodian of God’s message of the kingdom, but missed the Messiah when He came. What is the passage? Is this found in only one gospel or is there a parallel account? The reason we check this out is because we need to decide which passage we will use as our main passage (usually the longest). We also need to be aware of the others so we can compare the different accounts. If we see any differences, we have to ask why that detail was left out or included? What does it tell me about the author’s intent, the intended audience, the main point of the parable, etc. I prefer a literary approach which looks at the differences between accounts as clues to each gospel writer’s theme. I want to understand the point he is trying to make with this story, miracle, etc. Some prefer to try to recreate the historical event and take all the parts and meld them into one story. Parables are told in an historical context. Jesus is drawing on culture, historical events, etc. We need to ask what the historical and cultural context are. For example, when Jesus tells the parable about the nobleman giving his servants ten minas and then going away to receive a kingdom, He is alluding to an actual event that took place only a few years before. Archalaeus received the “rulership” Judea from his father Herod, but before he could take over, he had to go to Rome to be confirmed by Caesar. We also need to look at the immediate literary context. What is going on in the text both before and after the parable? What has just happened or what has just been said? Did Jesus perform a miracle immediately before or after the parable? Did that miracle illustrate the truth in the parable? In Matthew for instance, the pattern is to recount two signs immediately before or after a sermon. The signs illustrate and drive home the point of the sermon. If you check out the context, it will help you understand the main point of the parable. Understanding the parameters or context will keep you honest and on target with your understanding of the main point of the parable. What is the problem that prompted the parable? When Jesus told a parable, He was dealing with either a Question or an Attitude – Often both at the same time. The question might be spoken or unspoken, after all, He could read their minds. Or He might be dealing with a bad attitude. We have to examine the context to see if a question was asked or implied. And we need to see if there is an attitude that needs to be dealt with, etc. For example: In the parables of the lost sheep, lost coin, and lost sons of Luke 15, the context (15:1-2) reveals that the Pharisees were upset with Jesus for receiving and eating with sinners and taxgathers. The problem dealt with in the parables that follow are these: The unasked question is: What is God’s attitude towards sinners? The bad attitude is the Pharisees self righteousness and condemnation of others. If you don’t understand the question, you can’t come up with the right answer. What is the flow of the narrative? Does it center around the characters (biographical)? the sequence of events (chronological)? a logical argument? or an ideological theme? This is not as important as the other items in the list, but it is helpful to recognize the progression for organizing the story. For example, in the parable about the vineyard owner who went out to hire workers. He hired some at 6:00, 9:00, 12:00, 3:00 and 5:00 and the paid them at 6:00. That story is organized chronologically. You might best analyze the story by comparing what he did at each time. What did he do differently with each group? The parable of the Good Samaritan centers around three main characters. The Robbers, the Religious and the Righteous. The innkeeper is not very important in the story. Its progression is Biographical. Analyze, organize and outline the events of the story according to the progression you picked. Parables are told to make a point. They answer a question, deal with a problem, etc. What is the central truth or truths taught? Craig Blomberg has written a book on the parables and he says that the parable has as many points as it has characters. So, the Good Samaritan would have a main point that we learn from the actions of the Robbers, a main point we learn from the actions of the Religious (priest and Levite) and a main point that we learn from the actions of the Righteous (Samaritan). How does the parable relate to the kingdom program of God? Remember, that we said the parables were told to reveal truths about the kingdom. What kingdom are we talking about? There is much debate about this between and among Reformed and Dispensational theologians. Some say the kingdom is already here. Some say that there is no kingdom program in effect now but that it is all in the millenium kingdom of the future. Others say there is a spiritual aspect of the kingdom in effect now and the aspect of the kingdom program that involves the physical earthly reign of Christ is definitely going to happen in the future. They opt for a both and approach. What does it say about who will be in the kingdom? about how they will get there? about what those who are there or are going to be there look like? What secondary details of the story need to be understood? How do they relate to the main point or central truth? For example, maybe it would help to know how much a talent is worth in the parable about the talents? Do you need to understand hiring practices in the Middle East to fully understand the parable we mentioned earlier about the man who hired people at 6, 9, 12, etc? It definitely helps to understand marriage feast and banquet customs of that day when we come to the parable of the great banquet. Some say that a parable is not designed to walk on all fours. In other words, every detail in the story doesn’t have to have an analogy. That is probably true. Every detail does not, but as I study the parables, I am amazed at how many details do have significance and do have an analogy. E.g. The Prodigal son was said to have gone to work for a Gentile feeding pigs. Is that just an incidental detail not important to the story? I think it says more than that he was sinning. It links the whole parable back to the first two verses of the chapter. The Pharisees were condemning Jesus for eating with sinners and taxgatherers. Taxgatherers worked for Gentiles and the mention of the prodigal working for a Gentile shows that Jesus is dealing with their attitudes about the taxgatherers. I think the reason people say that parables do not walk on all fours is because they are over-reacting to the practice of allegorizing scripture that sometimes takes place and which was especially prevalent in the Middle Ages. Back then, they would take a true, historical biblical event and make each part symbolize or mean whatever they wanted. And they came up with some very fanciful interpretations. But they lost it by turning unto idols. For thus saith the Lord; Moses, Moses, come down quickly; for thy people whom thou broughtest out of the land of Egypt hath done unlawfully. And Moses understood, and threw the two tables from his hands; and their covenant was broken in pieces, that the covenant of the beloved Jesus might be sealed unto our hearts in the hope which springeth from faith in Him. When we allegorize the historical events of scripture that is bad. But parables are themselves allegorical (symbolical) because the events and people in the stories that Jesus told are not real, and they do stand for something else in the real world. For example, in the parables involving a vineyard, the vineyard owner obviously stands for God. We know that from OT passages that refer to Israel as God’s vineyard, and because Jesus himself interprets the parable of the sower for us. The point I’m trying to make is this: Although every detail may not have significance, most do. We just need to exercise control and make sure our interpretations are legitimate. Full parables – a story told to make a point. NOTE: The overall framework and much of the material for this series is from class notes taken during Dr. Mark Bailey’s class on the parables at Dallas Theological Seminary. As I taught this series at my church, I modified it and added to it from other sources like Craig Blomberg’s and Dwight Pentecost’s books on the parables. Dr. Bailey said we could post it on bible.org, but as I’ve changed things, I wouldn’t want Dr. Bailey to be blamed for something I said that he didn’t say or maybe agree with. And as it was intended for a Sunday school class presentation, I wasn’t as careful to use footnotes everywhere I should have.